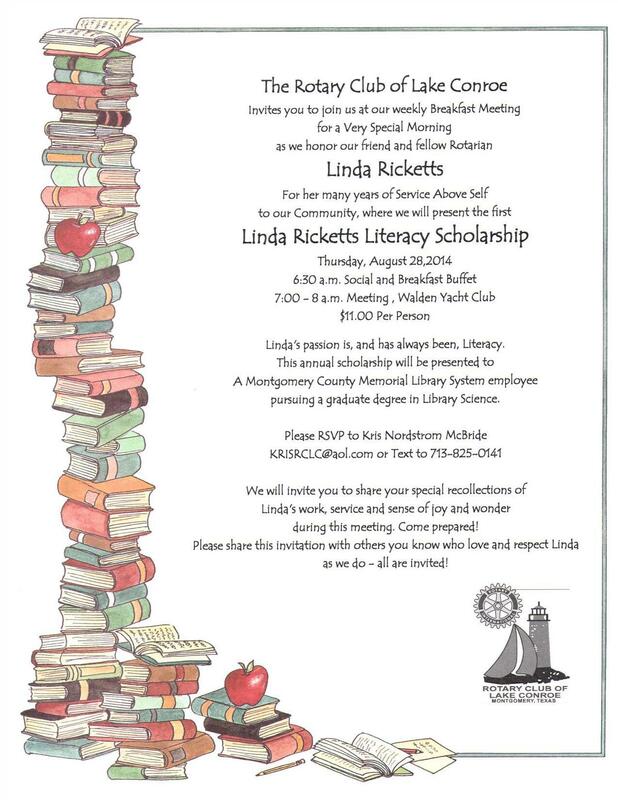 "You had me at Linda Ricketts" he said, and in that moment a new annual scholarship opportunity was born. 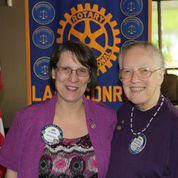 The Rotary Club of Lake Conroe is proud to sponsor the annual Linda Ricketts Literacy Scholarship, to honor one of our most beloved Rotarians. A group of five Rotarians, lead by Kris Nordstrom McBride, presented the idea of this new scholarship to 2013/14 RCLC President Bobby Morris and 2014/15 President Elect Craig Jones and Craig's response perfectly echoed what everyone was thinking - there is no one more deserving of having a literacy scholarship created in their name. Linda passed away in 2015, but not before helping us design and create this annual scholarship. Linda was a Charter Member of RCLC. She was new to Rotary when the club was formed, but she caught on quickly, hit the ground running and has never stopped. She was the club's 3rd president, leading the club for the 1997-1998 Rotary year. 1997-98 Rotary International President Glen Kinross chose "Show Rotary Cares" as his theme for that year, and that idea seems tailor made for Linda. She continually served at both the club and district level from day one, and worked actively to spread the word and work of Rotary each and every day. Linda was a multiple Paul Harris Fellow, and the recipient of the district's highest honor, The District 5910 Roll of Fame. Linda's passion in life had always been literacy. She volunteered with Literacy Volunteers of America for more years then we can remember, serving as CEO, Board Chair and most other leadership positions. She tutored LVA adult students, giving of her time, treasure and talents to make a difference in people's lives on a daily basis. The gift of literacy is one that keeps on giving, enriching the life of not only the student, but the entire family. Linda has been RCLC's Literacy Chair almost since day one, and continued in the role of District Literacy Chair for even more years. Linda retired from a successful career in the insurance industry, got bored pretty quickly, and went back to work making her passion her job, working with the Montgomery County Memorial Library System. Linda retired from that position in 2014 as her health declinded, with fellow employees giving her an amazing send off party. The scholarship is awarded to a current employee of the Montgomery County Memorial Library System (MCMLS) seeking a graduate degree in Library Sciences. When we approached Library Director JeriLynn Williams about this scholarship, her reaction echoed Craig's - utter delight and excitement. "We have an incredible staff at MCMLS" she said, "but Linda Ricketts is one in a million. Her passion, compassion, and dedication are unmatched". We could not agree more. Linda, we will always be honored to call you one of our own. Godspeed Linda.